I feel an extreme sense of peace about living here. I’m typically a fairly anxious person–and don’t get me wrong, I am still anxious about being alone all night with the kids because it seems like things always go wrong at night and I just need another set of hands or another adult for reassurance. I hate being in charge of everything all by myself in the dark when the world is asleep! However, this house and this land just feel like HOME. I don’t think I’ve ever felt this way about a place before. I didn’t expect to feel that way about here. I mean sure, it’s a fun place to rent for a few years. Something new and different, and beautiful surroundings. But it’s way out in the boonies. It takes me at least 20 minutes just to get to Walmart, if not longer. I don’t even like shopping at Walmart. It takes me more than an hour to get to some place like Whole Foods. That would be like a half day marathon dragging the kids up to the bigger town to shop. If I want to order health food on Amazon instead I have to wait for the internet to decide to work because it doesn’t work at all for hours at a time. 4g doesn’t work here either, not reliably. We’re in a dead spot on the coverage map. Then once the internet does work it’s super slow, and so I have to hope what I’m ordering goes through. Then even with two day shipping the mail man and UPS man don’t come to my door. The mailbox is half a mile away and the UPS man or FedEx guy leave packages with the old pink farm house at the top of the street over the hill. It’s so different from living in a suburb. I thought these things might make it kind of frustrating. They don’t so far though. Just new and different things to get used to as part of regular life. I don’t know why I feel so happy here. It just feels good. It feels right, like this is exactly where we are meant to be at this moment in time, and not even wiggling anxieties can question that feeling because it’s so strong. My parents brought me one of our TV’s this evening along with the PS3 and Xbox to watch DVD’s with. It somehow feels wrong to fill this place with big TV’s and technology. I’m glad we don’t have cable and Netflix doesn’t stream well. This afternoon the internet was out again, and so the girls watched a caterpillar they’d collected in a jar a few days ago eat an entire leaf. It took us hours to figure out which kind of leaves this caterpillar wanted to eat because we couldn’t google search to figure out what kind of caterpillar it was, then google search what the trees it ate looked like. Hysterical how much we’ve come to rely on Google just to function. We knew it was hungry because it was frantically crawling all over the jar and ignoring the sticks and leaves we’d given it. I thought maybe I’d read before that these types of caterpillars like cherry trees and similar varieties, and I knew that sort of tree had a long pointy leaf. Then we thought to look for a tree with leaves that had caterpillar nibbles off of them. Believe me, there are A LOT of trees to choose from out here. We tested out a billion different leaves and finally Mr. Caterpillar started happily munching on one specific kind. I actually think it may have been from an ash tree, but I’m not for sure. I feel like in town we could just look these things up or rely on an app, but here we need to memorize knowledge to have it in our heads. After we watched the caterpillar eat a leaf Ada fell asleep in the breeze from the screen door. She’s so sick. I’m sick also. We went to the doctor today and he said there’s been an outbreak of mycoplasma bacteria, which is not uncommon, and that’s probably what we have since we have no signs of a virus. (No bumpy throats, etc.) Mycoplasma causes walking pneumonia and other upper respiratory illnesses that are worse than just a common cold. That must have been what made Rosie’s lungs so sick last week. Ada has major congestion and high fever because she’s not prone to lung infections. Mine is festering in my throat and nose just waiting to explode into something horrible. More antibiotics, yuck. You can’t get over it on your own though, which is why after four days Ada still had a high fever off and on, and why Rosie (who is never sick for more than 12 hours) was knocked flat on her back a few days ago then got better rapidly with antibiotics. My neighbor out here is a school bus driver for the county schools and he told me yesterday that all the kids on his bus route have been sick with the same thing, then he caught it and couldn’t believe how sick he was. Fun stuff. Rosie probably caught it from that stupid candy jar at speech therapy. (At public school…) We haven’t been many other places recently. I guess it could have come from anywhere though, considering the incubation period is 1-4 weeks! 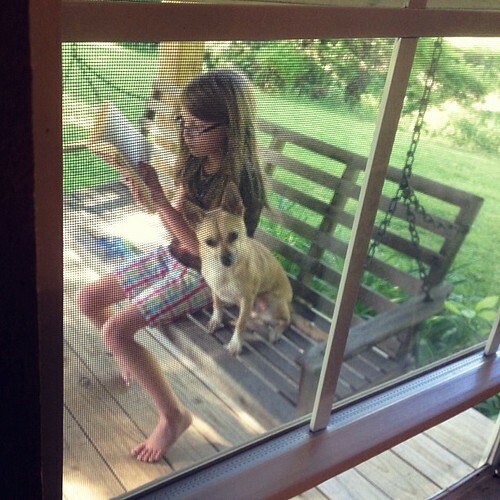 Anyway, while Ada was napping Rosie read a book on the front porch swing instead of playing games online, watching Netflix, or any of that stuff. I can’t wait to have a tiny squishy newborn out here, rocking on the porch and wearing him outside in the warm summer sun. He still doesn’t seem like he will be real, like maybe this whole pregnancy is only a figment of my imagination. Time will tell. I’ll be 29 weeks in a couple of days. It’s 5:20 in the morning. I hope this entry saves. The internet seems to be cooperative in the wee hours. Probably because nobody else in our area is on it. I woke up when Tyler came home from work and couldn’t go back to sleep because I was starving and had to pee. Story of a pregnant woman’s life, right? Now the roosters are crowing at everyone’s houses all around the hills and guess what? I don’t have to freak out that my neighbors are hating me because THEY ALL OWN ROOSTERS TOO. I can also hear the big herd of cattle up on the neighboring ridge across the road getting excited and bawling because they are ready to have breakfast. I super heart the cow moos. Reminds me of being a kid on my grandparents’ dairy farm. These neighbors feed their cows at about 5:45 in the morning and then again at 5:45-6:30 at night. You can hear cows screaming MURRRRRR! Feeeed meeeee! There’s also the occasional crunch on of tires on gravel and the rumble of diesel engines as neighbors all around slowly start their days either leaving for work or doing morning chores. The area is remote, but you can hear sounds like that echoing over the open land in the background. It’s so quiet out here. Nothing like our house in town where we hear trains, sirens, and traffic on on the state highway all night long. There aren’t even cars going up and down our gravel road at night unless the neighbors are out late for some reason. Instead in the dark you hear rain on the tin roof, the wind in the pine trees out front, and animal sounds. I’m trying to set a goal for each day. It takes forever to drive into town to our old house, round up stuff and get it into the van by myself along with the kids, then drive back out here and get it inside the cabin. My growing baby belly gets in the way, and I can’t lift heavy things, and the kids are all needy. So frustrating! I have photography work to do this weekend and I don’t even know where my cameras and lenses are. Crisis! Ah, Ada is waking up again…my cue to stop writing down trains of thought, cross my fingers, and hit save. Next story More Life Out Here! Previous story Views out here.